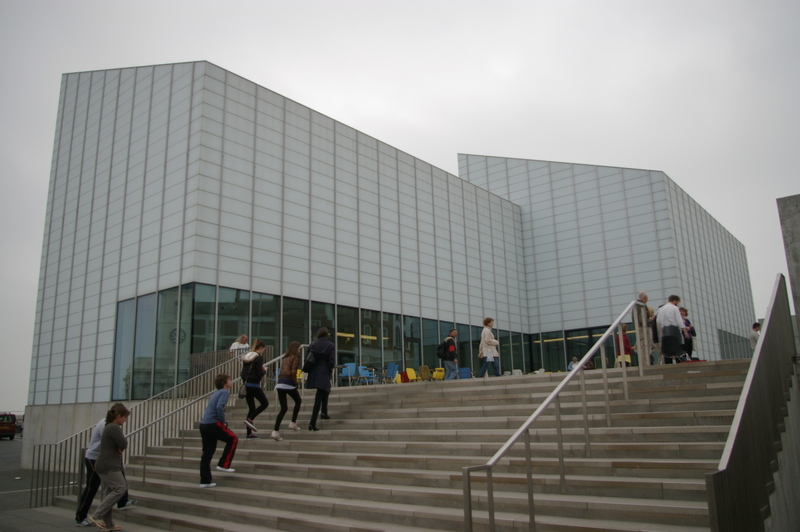 After an amazing sunny day of sailing at Whitstable on Friday, I decided to continue my coastal trend with a visit to Margate, specifically to the Turner Contemporary. But before entering the modernist wave-evoking structure, I took a small detour to find Tracey Emin’s I Never Stopped Loving You…or at least what was left of it. What I saw. Own photograph. Tracey Emin, I Never Stopped Loving You. Image via www.turnercontemporary.org. 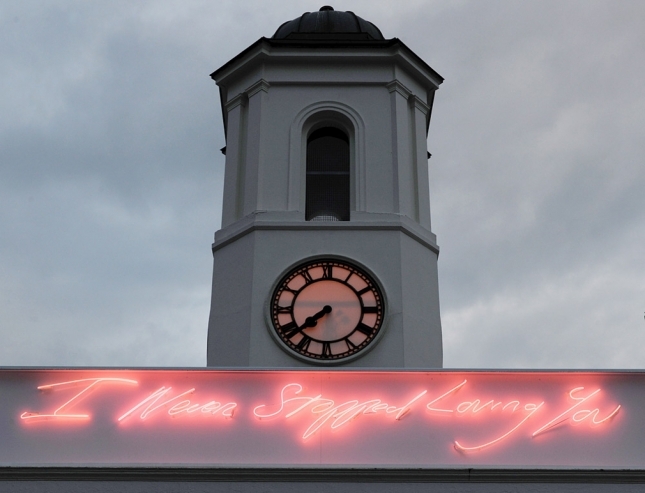 I found out later that the pink neon text was sold at auction for under £59,000. 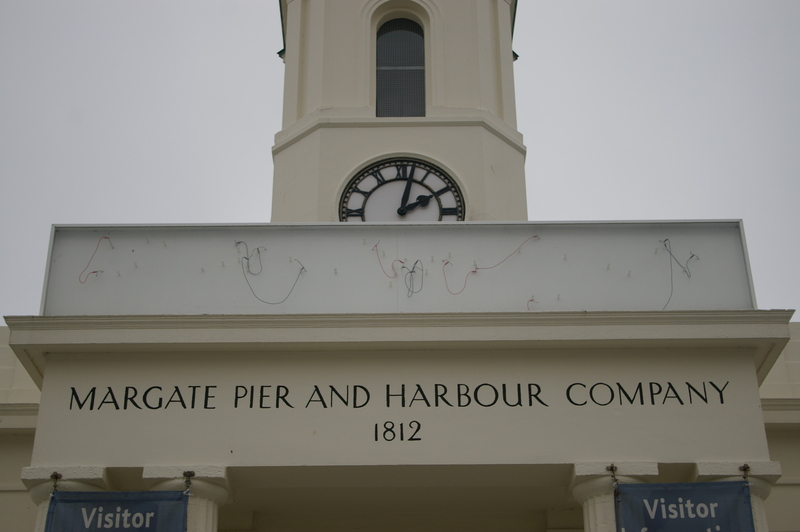 Commissioned by Turner Contemporary with the support of Thanet District Council, the text was Emin’s love letter to her hometown of Margate. During its Victorian heydays, the seaside town was very popular amongst tourists and beach-lovers. Nowadays, it is mostly lost in the memories of those who grew up there, by people like Tracey Emin, but also in the paintings of those who deemed it worthy of representation, notably J. M. W. Turner. 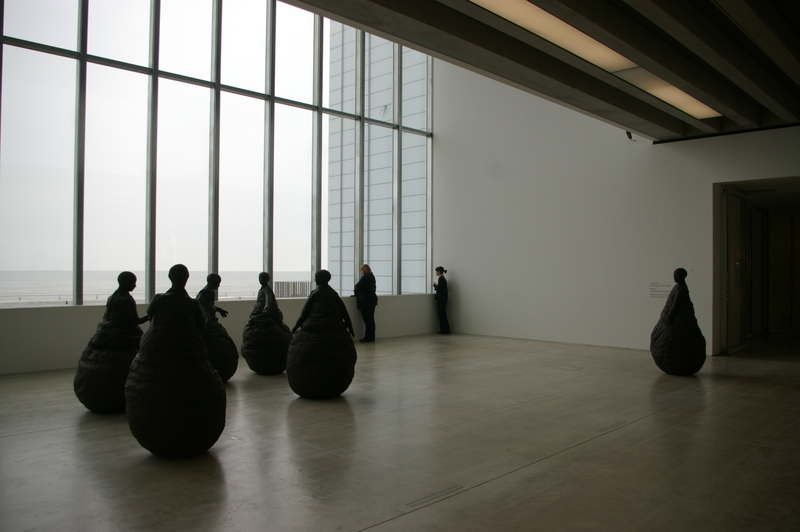 And it is through this love story that the Turner Contemporary becomes more and more significant, not just as an art gallery, but as an emblem for the local people. 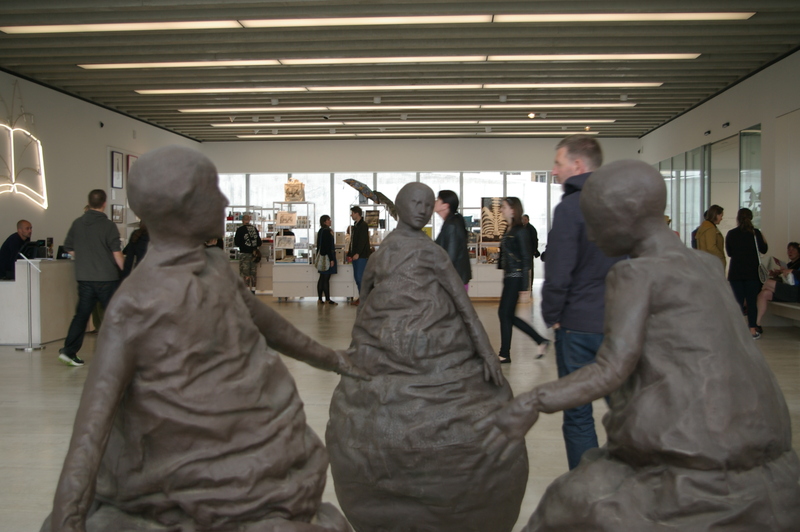 As I entered the gallery for the second time in my life – the first being four months ago – I was faced with six strange-looking figures in the distance, humanoid but with a rounded lower-half like a giant bouncy ball. I was in fact witnessing Juan Muñoz’s Conversation Piece III (2001). The bronze figures are suspended in the middle of a private conversation, their faces turned towards each other in a neverending psychological dialogue. Muñoz, who died aged 48, said of the piece: “You’re watching what’s taking place but you cannot answer back…You cannot collaborate in it.” The conversation is silent and it makes you curious about what they are talking about. Are they talking about the gushing waves ebbing and flowing behind them? Perhaps the conversation is about us as intruders into their personal space, secretly judging our every move, every step, and every whisper. Or maybe it’s about the isolated figure at the other end of the space, voyeuristic in stature, and as curious as a foreigner. Juan Muñoz, Conversation Piece III, 2001. Own photographs. Curiosity can drive us mad. It demands answers, yet a lot of the time we cannot obtain them. But this innately human impulse has also lent itself to the greatest discoveries of the world, and it is with this statement that I introduce you to Turner Contemporary’s latest exhibition, Curiosity: Art and the Pleasures of Knowing. Based on Pablo Bronstein’s Museum Section (2013) – shown in the first of 12 rooms – Curiosity brings together a wondrous collection of objects that once puzzled the general public, including countless experts in their respective fields. As viewers of these objects, these same questions often bring back to mind. However, the exhibition isn’t all historic artefacts. Interwoven amongst them are contemporary artworks designed to make you think, to question the possibilities. Some explore the way the mind works. Others reinterpret and adapt past theories into their work. But most importantly, they are pieces that force you to stand in front of them for longer than usual, preventing you from brushing past them until you can fully understand what they are trying to say. 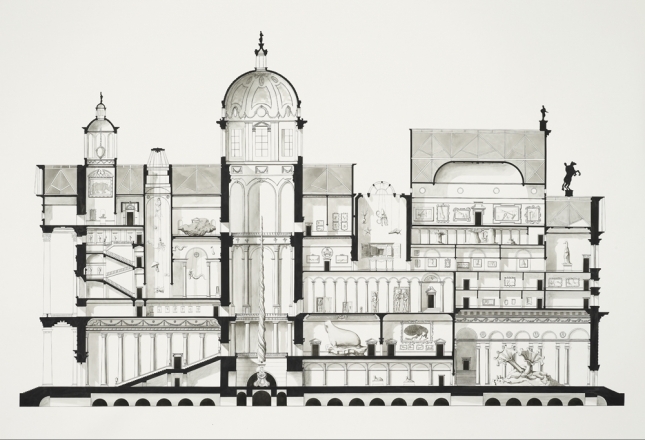 Pablo Bronstein, Museum Section, 2013. Image via www.turnercontemporary.org. Bronstein’s print alludes to a cabinet of curiosities, traditionally being an entire room filled with discoveries and curious objects. In other words, viewers to the exhibition – or any other museum – are already entering a cabinet of curiosities. While the print depicts an entire building, the next room presents us with John Evelyn’s own miniature cabinet of curiosities from 1652. Brilliantly carved out of ebony, fruitwood and ivory, the cabinet contains a multitude of drawers. The change in colour from ebony to fruitwood makes it look like a cabinet within a cabinet. In the centre, the figure of a man stands between two mirrors angled on either side of him. There are cyanotypes of plant specimens by Anna Atkins, Albrecht Durer’s woodcut of A rhinoceros (1515), and a meteorite that was cast, moulded and then recast again by Katie Patterson before being sent back into space. But in that same room we can also hear a soft, strangely calming sound resonating from Aura Satz’s Skyquakes in Ear Trumpets (2013) – an infusion of ear trumpets with a brass concert phonograph horn. The following room is what I would refer to as the Da Vinci room, simply because it contained only three sheets of paper from Leonardo da Vinci’s notebooks – two of them double-sided – and graciously loaned from the Royal Collection. There are pictographs with word puns, studies of geometric shapes and hidden architectural plans, complete with his reversed handwriting, something that baffled people for quite some time. However, the one-sided sheet, entitled A cloudburst of material possessions (c. 1510-13), was a composition depicting everyday utensils raining from the sky. Below it were the words “Oh human misery, how many things must you serve for money?” The function of this drawing is still largely unknown. 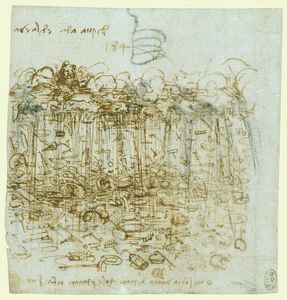 Leonardo da Vinci, A cloudburst of material possessions, c. 1510-13. Image via www.royalcollection.org.uk. The legend of the Loch Ness monster welcomes us through Gerald Byrne’s photography and accompanying film in the dark adjacent room, analogising the eyewitness accounts of the legend to a story about photographic images and the reliance on them as evidential documents. Next door opens up into a slightly larger room than the preceding four. The first things we see are Matt Mullican’s oilstick rubbings pasted on an entire wall. 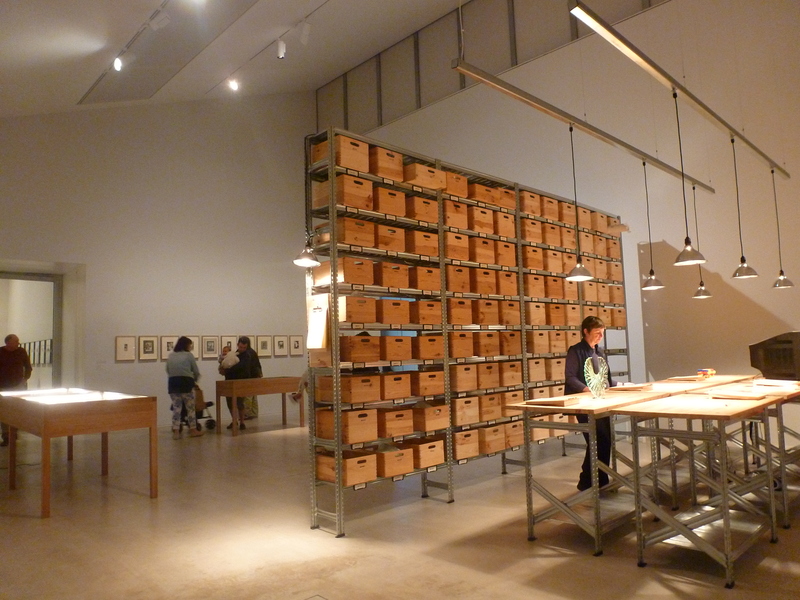 In front of them is a wooden plan chest containing the rest of those drawings. Unfortunately, despite the temptation, we weren’t allowed to reach into the chest’s compartments to see them. For Mullican, these drawings depicting graphical pictographs and symbols make up an eccentric cosmography. On an easier note, two screens close by show him in a state of hypnosis, curiously exploring the contents of his studio with a video camera. Adam Broomberg and Oliver Chanarin, The Polaroid Revolutionary Worker’s Movement, 2013; I.D. 0033. Image via www.broombergchanarin.com. In the centre of the room are some incredible glass models of sea creatures by Rudolph and Leopold Blaschka, while Philip Henry Gosse’s colourful drawings of marine creatures adorn another wall. Displayed below them are seven Rolodexes of business cards from the Los Alamos National Laboratory. 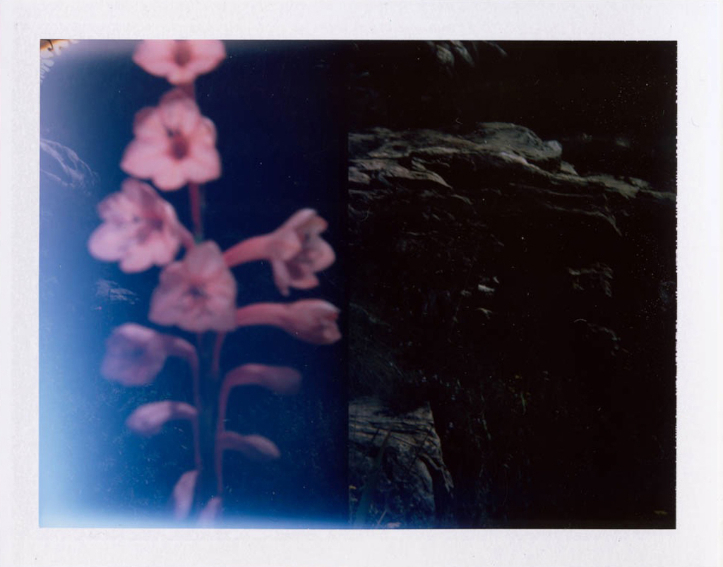 However, I was particularly drawn to a series of Polaroid photographs by Adam Broomberg and Oliver Chanarin. The images in The Polaroid Revolutionary Worker’s Movement (2013) were taken with a camera geared to produce ID photographs for passbooks. It had two settings: non-flash for ‘normal skin’ and flash for dark skin. Broomberg and Chanarin used this double setting to produce pairs of images – one light, one dark – exploring the racist elements in the history of photographic technology. The rest of the room presents to us Roger Caillous’s collection of agate, several fertility dolls, and intricate ivory anatomical figures. The walls are lined with various photographs, from Miroslav Tichy’s voyeuristic images of women to Corinne Mae Botz’s disquieting photographs of miniature interiors, depicting scenes of unexplained deaths, each containing a diminutive corpse. In the corner hangs the first oil painting in the exhibition, Nicolas Maes’ An Eavesdropper with a Woman Scalding (1655), where a young servant girl overhears an argument in the nearby room. In another dark room, Tacita Dean – who was born in Canterbury – exhibits one of her films about the artist Claes Oldenburg in his studio. As you move onwards into the corridor, take a moment to look to your left. No, I am not suggesting you pass through the exit doors, nor am I asking you to look blankly at them. Placed awkwardly beside those doors is a glass display containing a creature that has the head of a peacock and the body of a penguin. 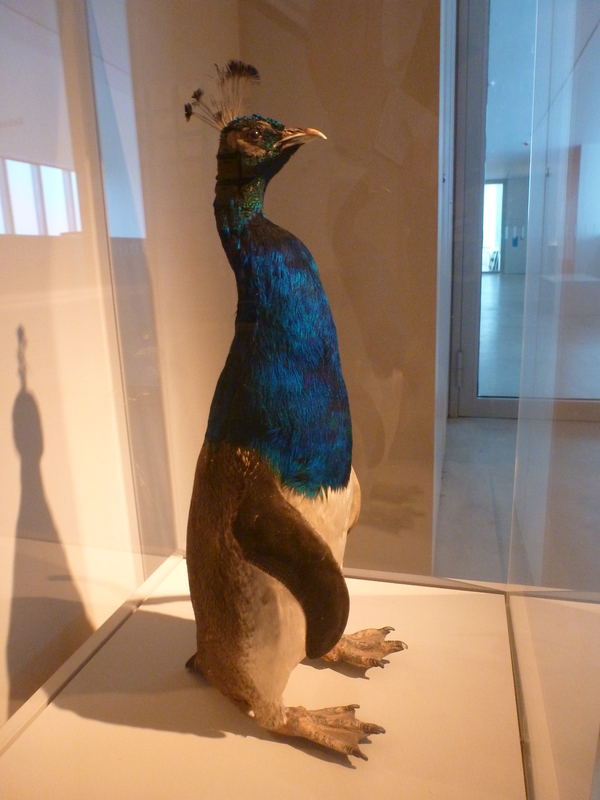 Entitled Misfit (Penguin/Peacock) (2005) it is part of Thomas Grünfeld’s series of hybrid animals, another of which – Misfit (St. Bernhard/Sheep) (1994) – is exhibited outside the exhibition space. Grünfeld’s Misfits series is an extended joke, parodying the human objectification of animals. Through breeding and training, we are moulding them to suit our needs and purposes. The latter exhibit is a sheep/dog, where one is bred to control the other – it’s a bit like a dog chasing its own tail. Despite the weird hybridity, the naturalism of our perceptions to interpret these creatures is really interesting. I still find the penguin/peacock combination remarkably cute. I’m surprised they didn’t exhibit it on a raised pedestal. Thomas Grünfeld, Misfit (Penguin/Peacock), 2005. Own photograph. In the same room we can see Laurent Grasso’s photographs of popes looking through astronomical telescopes in the Vatican Observatory, defying a belief that was originally challenged by Galileo Galilei. A reminder of his heretic trial in 1633 is hinted by the display of his Sidereus Nuncius (Starry Messenger), first published in 1610. The photographer Nina Katchadourian presents us with The Continuum of Cute (2007-8), while in the next room we see images of her dressed in various Flemish guises while being inside the toilet of an aircraft. But the most conceptually brilliant work I saw happened to be standing directly opposite those photographs – and it wasn’t even that complicated of a concept. I was faced with a white wooden door, typical of the many that open and close across the various areas of the world. Seeping from underneath it was a bright light – again, nothing we haven’t seen before. But somehow, it makes us curious and we start asking ourselves questions. What lies behind that door? What exactly is producing that light? Could there be an open window? 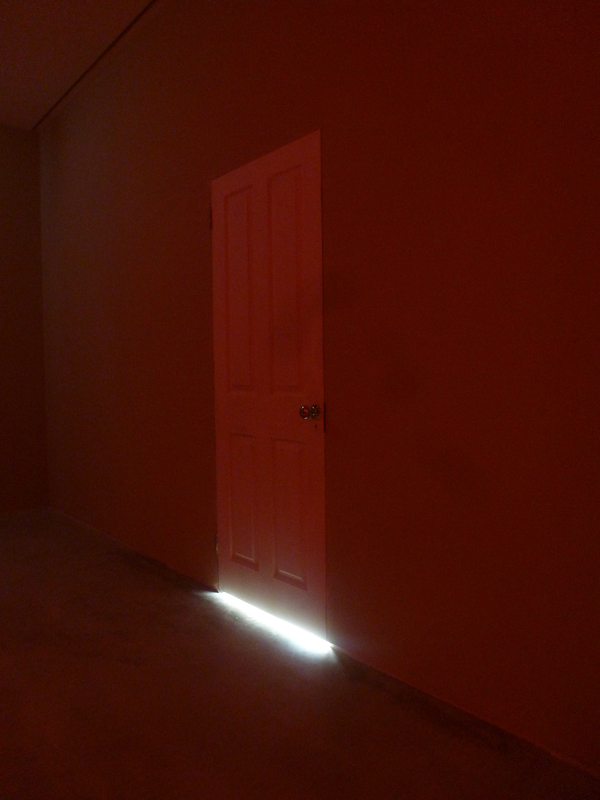 Maybe it’s just one of the many doors that lead into the gallery’s offices. Should I open it? Am I even allowed to open it? Hell, am I even allowed to touch it? As these questions fill up our minds like plastic balls in a children’s play area, our body draws closer to the curious door, our arm in mid-air, hesitating to the dilemma of opening that door. You turn the door knob. And then it hits you. The penultimate room but one takes the Horniman Museum’s walrus as its feature exhibit. The now-stuffed animal was shot and first exhibited by J. H. Hubbard, consequently brought to Britain in 1886 alongside his collection of Canadian wildlife. We can see some split-hair artworks by Guinness Book of Records winner Alfie West who won a place for the most splits made lengthwise in a single human hair. In another display are some personal objects belonging to John Dee, used for the predictions of supernatural phenomena. A king penguin from the Ernest Shackleton expedition lies in a small crate, while J. M. W. Turner’s watercolours of birds embrace an entire wall. In the far corner, Nina Canell’s The New Mineral (2009) shines brightly from one of its light bulbs, while eight radiometers mounted on spindles surround it. The strange-looking piece hints at William Crookes’ early radiometer from 1873. As the light intensity increases, the vane inside each radiometer spins more rapidly. Two other rooms branch out from this area: a dark room screens a documentary about jellyfish, while the other one, well-lit, acts as a maquette for a Museum of Switzerland. The room is lined with masks and folkloric drawings, the labels are handwritten in capital letters, and they run through a folk-heavy history of the country. Past the exit doors, there is a board where you can write down your own curiosities. I left them with “Why did the chicken cross the road?” in bright green ink, courtesy of my lime-green Lamy Safari. I think it would be safe to say that Turner Contemporary have really outdone themselves with an exhibition of this calibre. Walking into the exhibition reminded me of the British Museum, merged with the Natural History Museum, stirred with the Science Museum, with a hint of Tate Modern on the side. It doesn’t confine itself solely to art, nor does it limit itself entirely to science and discovery. Instead, it combines both to force our curious minds to think and wonder. Questions are asked, heads are tilted, and perceptions are re-evaluated. If they keep doing this well, I might just forgive them for my one hour bus journey from Canterbury to Margate. P.S. Be sure to pick up an exhibition/souvenir guide at the front desk. The curator Brian Dillon has written a really interesting and lively guide to introduce us to the exhibits. The language used is reminiscent of an explorer rather than the usual, rather bland, academic language seen in almost all exhibition guides. While doing so, it is incredibly concise and to the point. The accompanying catalogue is also really nice. It is linen-bound with a hardback and it retains that incredible smell of fresh-printed books – who could resist such a combination? The essays are well-written, the illustrations suitable and detailed. But most importantly of all, it doesn’t even take up that much space! Curiosity: Art and the Pleasures of Knowing runs until 15th September 2013 at Turner Contemporary, www.turnercontemporary.org. Previous Post Two-Faced Fame – celebrity or commodity?